It is a known fact that the government of India is making its citizens to link their Aadhaar card number with bank accounts, PAN card, mobile number, and several other schemes to make it the most authentic way for identifying a person( identity proof). 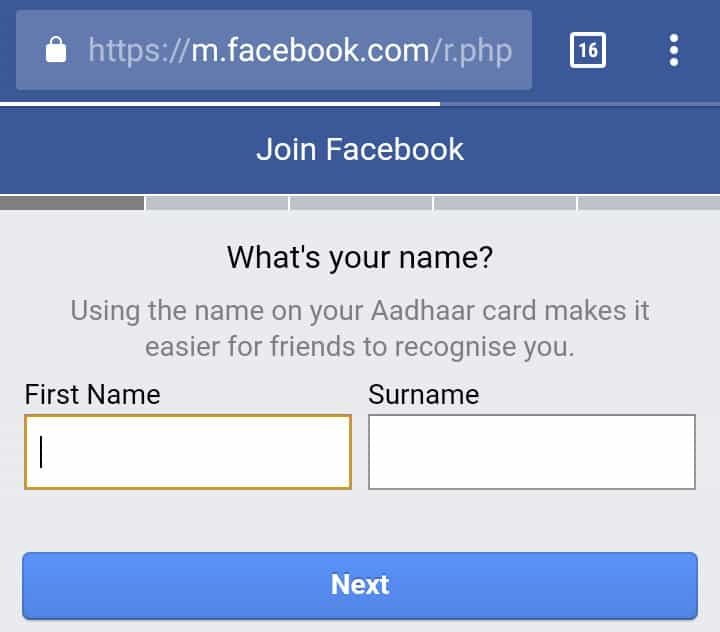 Now, the social media giant, Facebook is also asking the new users to enter their first name and last name based on the information on their Aadhaar card. This is just a small test the company is trying out to reduce the number of fake accounts on the social media as India is the country which contributes over 240 million users on Facebook making it the second largest market for the company after the United States. Facebook’s prompt was first spotted by few users on Reddit and Twitter who then took the news to those sites. “What’s your name? Using the name on your Aadhaar card makes it easier for friends to recognise you,” the prompt reads. As it’s just a test, the prompt will be seen by only a few users who try to create accounts through the mobile app. Facebook says that it’s just an optional prompt and it’s not mandatory for the users to enter their real names as on their Aadhaar cards. And it is worth noting that the company isn’t asking other details on the Aadhaar card such as the Aadhaar number, address and etc. This move is aimed to make it easy for the people to recognize their friends on the platform. What do you think of this move by Facebook? Will it be able to curb the number of fake accounts? Share your views in the comments!